Creative play is a great way for children to express themselves, innovate and develop their imaginations. Being creative and imaginative helps children to develop the skills to be innovative problem solvers as they reach adulthood and these skills are important no matter what career path they take, from artists to scientists! Creating something from their imagination can raise a child’s self-esteem, help process emotions and develop spatial awareness. Arts and crafts and modelling also encourage children to use their hands which builds up the strength and coordination (known as fine motor skills) needed for holding a pen or pencil to learn to write. It also teaches hand – eye co-ordination and concentration which are useful for everything from writing to sports! 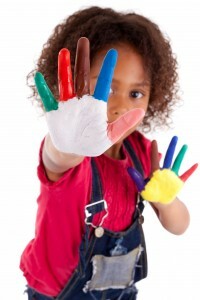 Play can encourage children to express themselves and find their own sense of identity. Creative and imaginative play is a comfortable and non-threatening place where children have control over what they do. Through imaginative play and art and crafts, children can reflect their emotions and raise their self-esteem as they showcase what they have created.